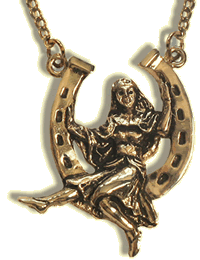 If you want to win, and win big, let The Lady Luck Amulet take you by the hand. She could lead you to winnings you never thought possible. I received my Lady Luck, and on the first weekend, I won $500 at Bingo, and $265 and $302 in the Little Lottery. I hope she keeps bringing me luck and maybe I will win the big one. Thank you for the fast shipment. I will order more for other people soon. Lady Luck works! My luck in the game of chance did improve. I won several times in Bingo. Unfortunately I lost my Lady Luck and haven’t won anything since then. But I’ve place another order. I ordered this necklace at the end of November. It works! The Lady Luck Necklace works wonderfully, you really should try it! Believe me I had no luck at all so I ordered this necklace and my luck changed big time. I now win instead of losing. I love my Lady Luck.